The site of the proposed Puzzles bar in Bridge Street. The latest addition to Peterborough city centre’s night time economy – a “relaxed” bar called Puzzles? - looks set to open before Christmas. Matt Murphy, one of the two men behind the venture in Bridge Street, an empty unit most recently use as the Literacy hub, revealed they had been working feverishly to be open in time for the peak of the festive season after planning permission for the change of use was granted earlier than expected. Puzzles bar coming to Bridge Street. “We got the keys on Friday and it has been all systems go to bring the months of planning to fruition,” he said. Matt added that the anticipated opening date was Wednesday, December 21 - and he had already booked a live act for the Friday (23rd). He said the look of the bar, which would accommodate around 50 customers, would be “rustic/industrial” with exposed brickwork, floorboards and extraction. “We are hoping to create a nice atmosphere, laid back and comfortable, something quite different,” said Matt, who added that the bar name was inspired by the two main characters in American sitcom How I Met Your Mother who “opened a bar they would like to drink in”. 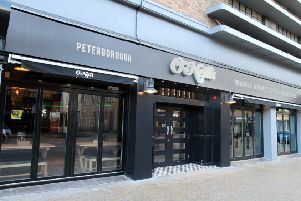 Puzzles?, which will also host open mic nights, should be joined on Bridge Street next year by a £1million Middletons steakhouse and grill, subject to planning permission for the conversion of three units close to Argo Lounge.